Oh I like this one. We haven't had any snow either maybe some will blow this way soon. Happy new year!!!! I love the idea of serving up lunch in a muffin tin! My kids would love it...but I think maybe I should invest in a few that are fun (instead of my old scratched up hand-me downs!) before giving it a try!! Thanks for the inspiration! Very cute. Still would not convince my finicky son to choose more healthy eating. You do a good job with your muffin tin fillers. Cheers for the cutest Muffin Tin of the year!! Very cute. Great start to the New Year! Another cute and yummy meal! I think this may be the only way we see snow. I will have to look for a snow tin. Really Cute tin!! But you always have cute tins. I hope you don't get any snow, because that will mean I get more than you. I don't like snow!! 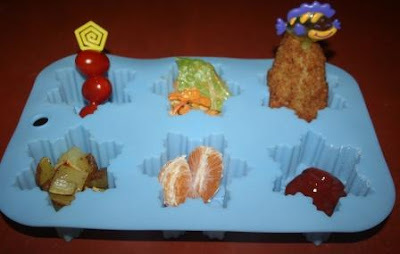 Fun lunch, and I love that muffin tin! No snow here either, and it is not natural. I keep hoping for a few flakes, at least. Super cute!! I hope you had a great New Years!! Parmesan crusted fish! YUM. My 4 year old loves spinach salad. I'm happy to have at least one salad eater. I really don't think kids are supposed to like salads so I wouldn't be too concerned. He does eat his veggies, just not in a salad format. Happy New Year Lisa! Siempre encantador tu blog, un placer haberme pasado de nuevo. it's wonderful lisa, i would love someone to prepare that for me!! no snow here either. it was 60 yesterday but i am pretty sure the cold air is coming!! We're starting with snow now, supposed to get six inches by tomorrow. Telephone is out and i-net spotty so it's quiet today. We have a little snow today here in northern Pa. But not too much so far. I gave the girls a snowman tin today. I love your snowflake tin and the food you put in it looks scrumptious. The salad sounds delicious and I haven't had roast potatoes in ages. Is the fish homemade. It sounds yummy. Would you consider sharing the recipe? That Pierce! He eats a lot of things that my 14 yr old daughter wouldn't but yet he still won't eat the salad! lol My kids will not eat tomatoes but they will eat ketchup! lol Go figure! I always like seeing your muffin tin ideas. We had snow flurries today--so maybe you'll get some snow now. And my kids LOVE clementines. They eat several a day. I love, love , love it! Well, at least you are seeing some snow flakes! Supposed to be 60 here on Thursday. Maybe eventually he'll like them? I hope so!